For the longest time, I thought that the only thing Tahini was good for was to be one of the many ingredients for Hummus. But, boy, was I wrong. It seems it is essential to the flavours of many dishes in Northern Africa, Greece, Turkey and the Middle East, used for savoury and sweet preparations. I may have mentioned in the Hummus post that typically Tahini is available only in gourmet stores (read inconvenient and expensive). As a result, I hardly ever had it at home and it was never worth it to run out for it when all I needed was 2-3 tbsp for a batch of hummus. One day, I decided to make my own, following some basic recipes I found on About. It turned out well, but after a few hummus rounds, it sat forgotten in my fridge for months! I rediscovered it a few weeks ago and tried to find some other uses for it — and was blown away by the options I found! I’ve been OD-ing on it ever since and just made another jar, which I’m sharing with you! 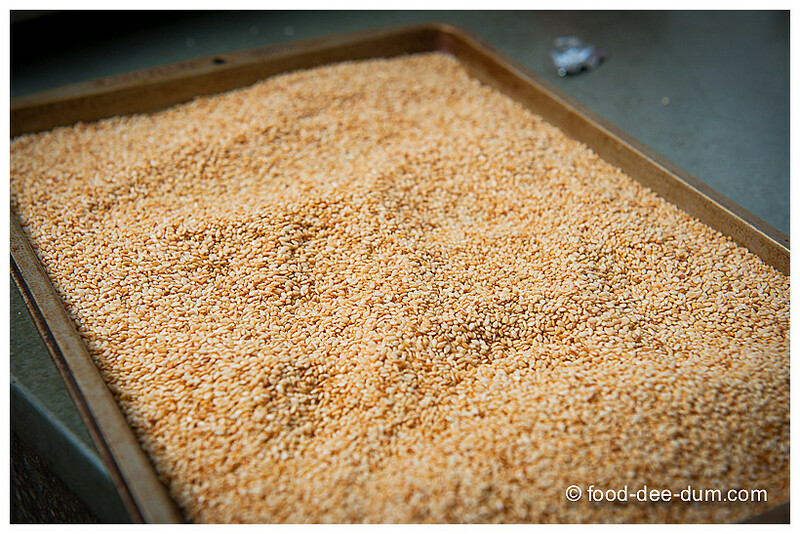 First I measured out the sesame seeds. In a wide skillet, I toasted these on medium-low heat until they were almost evenly golden. It’s important to keep the heat on the lower side and stir almost continuously to avoid burning or uneven toasting. 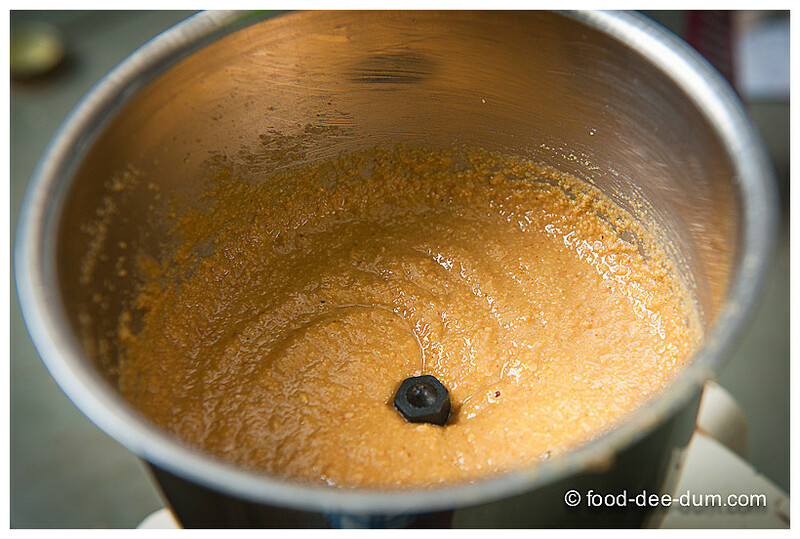 If the colour turns dark brown, then the Tahini will taste very bitter. Also, they can be toasted in an oven as well, but the stovetop method gives you more control for even toasting. This is how they looked halfway through. It took me around 20 mins to toast these. When they were done, I took them off the heat and immediately transferred to a tray and spread them out, leaving them to cool. I don’t have a picture of the final colour in the pan because even after turning off the heat, the pan was hot enough to burn them — I needed to transfer the seeds to the tray ASAP. I allowed these to cool completely in the tray — about 30-40 minutes. It helps to occasionally stir the seeds around a little to re-distribute them and to let out any trapped heat. 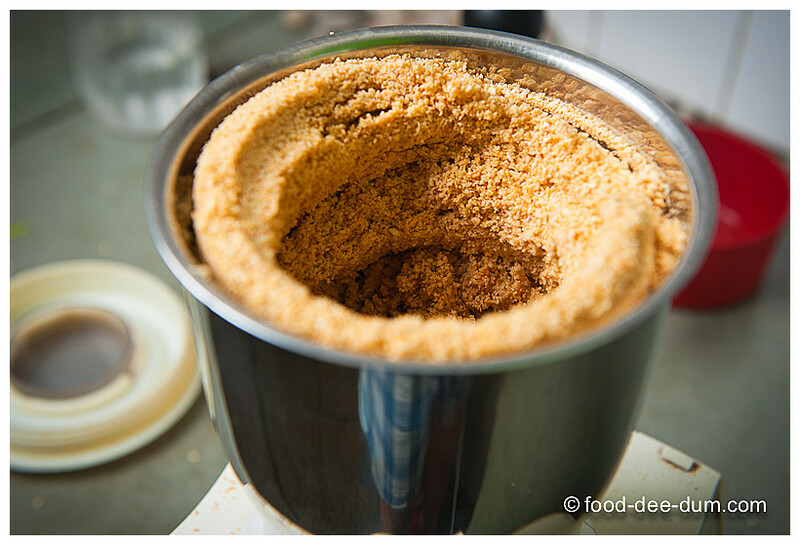 Once cool, I transferred them to my mixer-grinder and ground them up to a coarse powder. It helps to use the grinder in short bursts — to protect the motor since we cannot use any liquids until this stage. 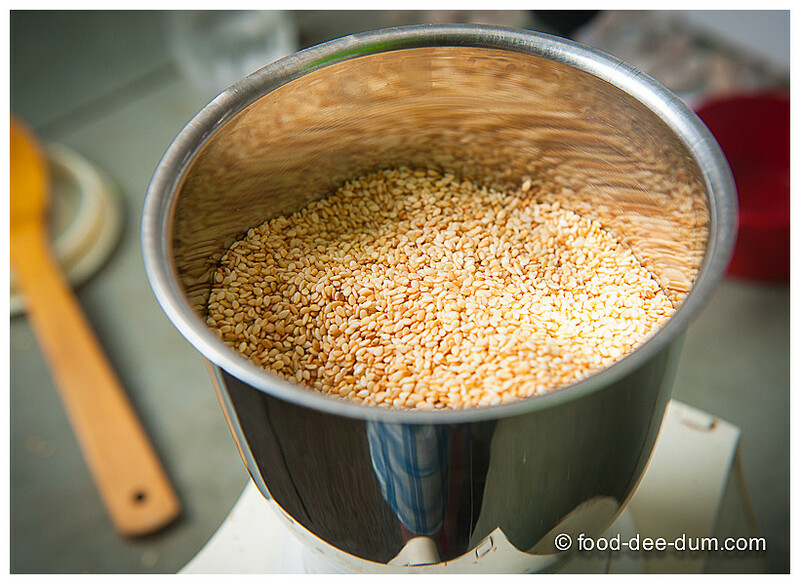 It is important to grind the seeds dry first before adding the oil. Else it won’t grind evenly. I then added the oil and salt and proceeded to grind further till it formed a grainy paste — you can grind till it is totally smooth, but I like the grainy, coarse texture. I transferred this to a clean glass jar and placed it in the refrigerator, where it will keep easily for 6 months. 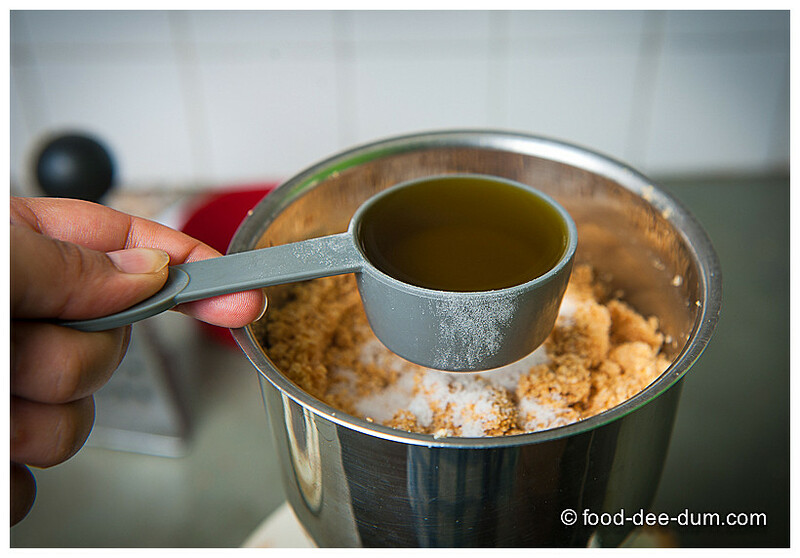 You can add lemon juice (along with the oil and salt) too, but that would restrict the usage in sweet items. The little bit of salt won’t do any harm though. As an ingredient in hummus — and not just chickpea hummus; you can make hummus with a whole lot of other bean varieties and even boiled peas. 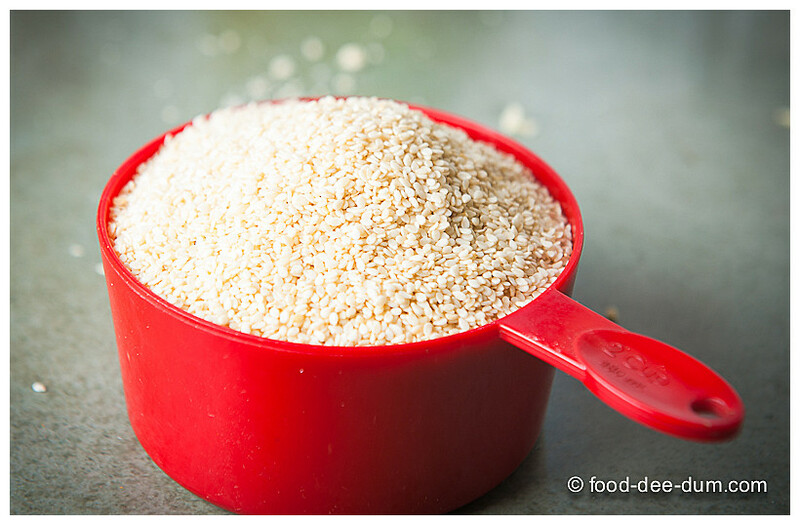 Sesame-Mayo Dressing to be drizzled over salad or even grilled chicken/ fish: for 2 servings, add 1 tsp Tahini to 2 tbsp Mayo and thin it down by adding a little milk or buttermilk. Adjust salt+pepper. Lemon-Sesame Dressing (to be used as above): for 2 servings, mix 1 tsp Tahini with 2 tbsp lemon juice and 1 large garlic clove crushed. Season with salt+pepper. 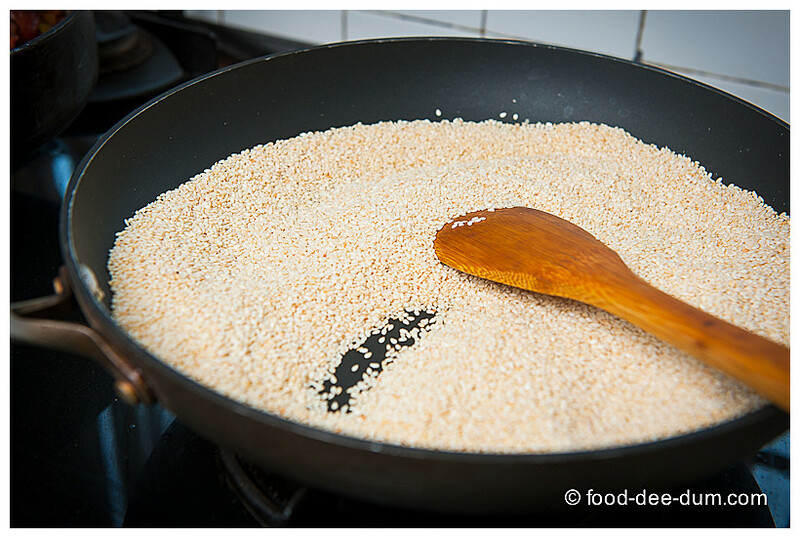 Honey-Sesame Dressing (to be used as above): 1 tsp Tahini + 1 tbsp honey + 2 tbsp Lemon juice + salt & pepper to taste. Sesame Noodles: Toss cooked spaghetti/ linguine in a mixture of Tahini, Olive Oil, Lemon Juice, Crushed Garlic, Chilli Flakes, Salt, Pepper & Cream – top with thin slices of grilled chicken and bell peppers and sprinkle with toasted sesame seeds. Savoury Spread: Add 1 tsp Tahini to 2-3 tbsp Greek/ hung thick yoghurt/ sour cream/ Mayo along with salt+pepper to taste – use as a spread on toast before layering on sliced cucumber/ tomato/ bell peppers/ onions/ ham etc. 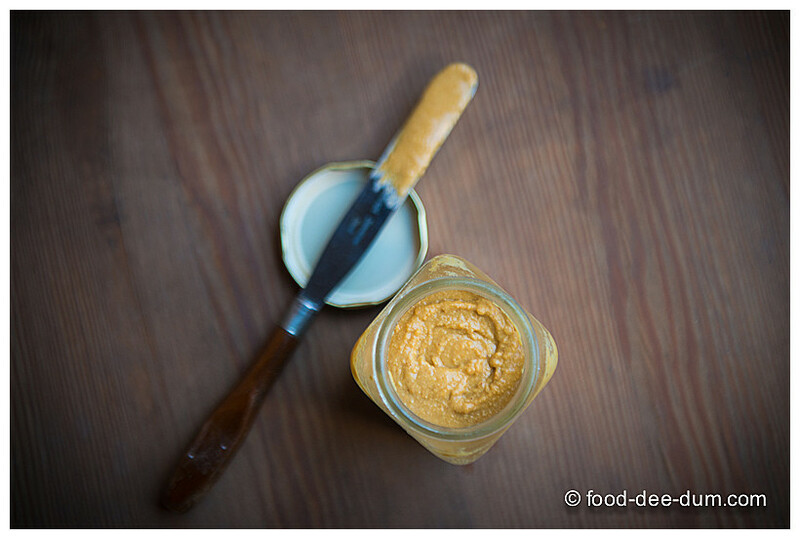 Sweet Spread: 1 tsp Tahini+2 tsp Honey+1/2 tsp Cocoa as a spread on toast! Any other way that you know of? Do share in the comments section!